Our day started out with much more sleep that we expected, although still not enough. The ferry was supposed to get in at 1:45 am; however, the winds were too strong so the ferry could not dock. We spent the night anchored in the harbor. This caused problems for a lot of people on the ferry, but worked out well for us. After sleeping in the terminal last night, we decided to buy two dorm berths ($28 each) for napping during the day, and some rest at night. With the delay, we both had a comfortable bed throughout the night. Nice! One thing to note about Marine Atlantic is that they do not allow you to sleep on the floor, so pulling out our thermarests wasn’t an option and sleeping in chairs is not particularly restful. After arrival, we headed to the ferry terminal to get ourselves organized for riding. When the ferry was due to arrive at 1:45 am, we had planned on sleeping in the ferry terminal. 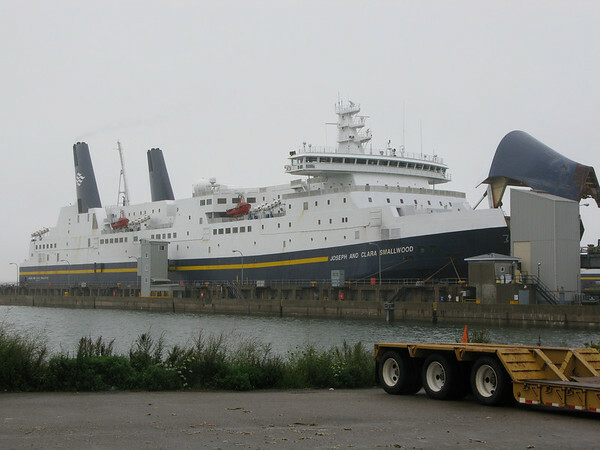 We are glad that we did not need to as the North Sydney terminal is not nearly as big as the Argentia terminal is, so we would have found it difficult to find space to sleep. As we were getting organized a cyclist came up to talk to us. It turns out he was part of the group doing Tour du Canada (http://www.tourducanada.com/) this year. It’s a supported cross-Canada ride with camping and shared food prep, so fairly inexpensive. This year there were about 30 cyclists doing the ride. Unfortunately, the ferry was due to depart very late (over 14 hours late). After our late arrival, it had to get to Port aux Basques and back before heading to Argentia. This means the Tour du Canada folks will arrive at 5pm tomorrow at the earliest, and will not be able to ride to St. John’s immediately upon arrival. Several of them had planes to catch on Sunday, so this was a big deal. For a few, their Tour du Canada ended at the North Sydney ferry terminal as they caught the bus to Halifax. At the ferry terminal we noticed that they had a scale for weighing luggage. We decided to take the opportunity to weigh our panniers. According to their scale, Becky is carrying about 60 lbs and Scott is carrying about 90 lbs. This is about 50 lbs more than Becky estimated and about 25 more than Scott had estimated. We wonder if the scale reads a little bit heavy, or we’re carrying a ridiculous amount of stuff! Since the distance between Sydney and L’Ardoise is about the same as Louisbourg to L’Ardoise, we decided to check out Louisbourg. We both found that being back on the bikes after almost a week was a struggle. We both expected that our bodies would be in better shape by this point in the trip. We are regularly reminded that we are not in our 20s anymore and our bodies need a little more recovery and preparation. Becky felt that her legs were much more tired than they should have been. One issue was that with all the chaos at the ferry terminal this morning, we missed our morning yoga practice. After being off the bikes for several days, yoga is extra important to ensure our muscles are happy. Another note is that we each need a good soak in the tub after several days of long riding. Becky forgot this, and didn’t take the opportunity while at Fraser and Judy’s. Scott’s legs were in a bit better shape, but not up to par either. At our lunch break today, a women says to us “I’ve never seen a bike like that before!”. Over the last five weeks we have heard many different people say “I never sees a bike like that before”, but we’re in Nova Scotia now, not Newfoundland. Becky was struck by the varying forms of English across the Maritimes. We like to think of Canadian English as homogeneous, but it really isn’t. Upon further discussion, we discovered she is a cousin of Steven who is bicycling with David across Canada from Newfoundland to Victoria. You may recall from an earlier post that we met David’s mother Isabelle at Battle Harbour. Small world! Unfortunately, we didn’t catch her name. It’s still a struggle for us to introduce ourselves when chatting with people. 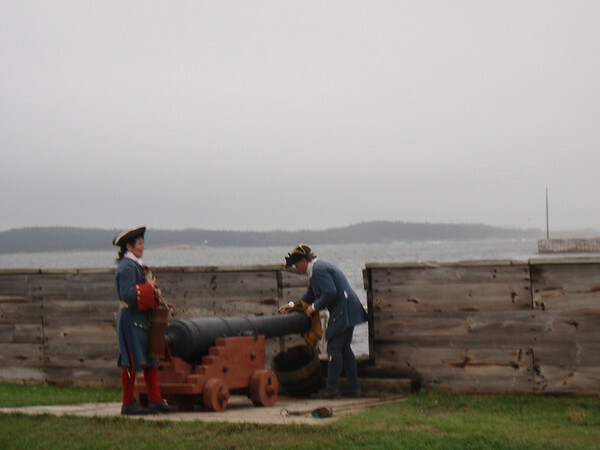 After arriving in Louisbourg, we had a brief visit to the Louisbourg National Historic site. Similar to L’Anse-aux-Meadows, we arrived within an hour of closing. Since we were not going to be able to see much of the site, the folks let us head down for free (saving us the $17 each fee). We did get to see a couple of the buildings and get a feel for the community. We really enjoyed the presentation of the cannon that officially closed the site at the end of the day. Definitely worth a longer visit in future, but for now we’re on to L’Ardoise. This entry was posted on Friday, August 29th, 2008 at 8:34 pm	and is filed under Canada, Journal, Nova Scotia, Visited Places. You can follow any responses to this entry through the RSS 2.0 feed. You can leave a response, or trackback from your own site.